Playing in a group is an important part of music education and a valuable supplement to private lessons. Students find enrichment through ensemble participation, and the responsibility of playing with others helps with sight reading, counting, and multitasking, and leadership skills. 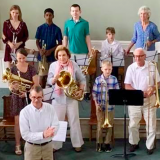 The ensemble experience also helps develop an understanding of how one’s instrument part fits into the whole and provides the opportunity to perform for a live audience. Ensembles meet weekly, working on repertoire for community performances. Everyone is welcome to join our ensembles whether or not they are also taking private lessons. A $15 registration feel applies for students not currently enrolled in other programs.